BlogHome » Blog » Blog » decorator show house. After finishing up another successful Decorator Show House, I am ecstatic to show you pictures of the rooms I did–I ended up doing a bedroom AND a jack-and-jill bathroom this year. I was so excited to participate in this great event again this year-for those of you who don’t know, this was the second year that the Decorator Show House took place. Its proceeds benefit the newly opened Faith Refuge for Women, which is a truly wonderful facility. For more info on it, check out their website. When I was asked to be a part of the event this year, I was thrilled to pick out my room-the house was full of so much potential, but when I stumbled upstairs to the bedrooms, I knew I had found my spot. 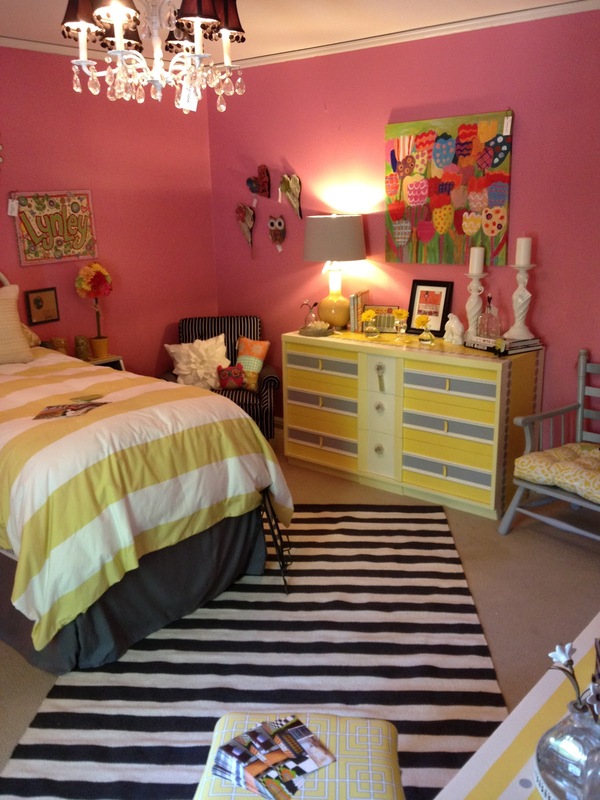 Two bedrooms upstairs were………HOT PINK. Pepto Bismol pink according to some. we didn’t hold up a bottle for comparison but…. you can see the match is almost perfect! You could literally see a pink glow down the hallway from the rooms, they were so bright! The bathroom connected the two rooms, and I couldn’t just leave it alone. I knew that someone else would be doing the other bedroom, so I thought this bathroom would be a wonderful “transitional” space between two most likely diverse designs. After choosing to do both the bedroom and bathroom, I left with so many ideas going through my head! I was excited about all the possibilities I had-but I think I had a few people who thought I was a little crazy for not painting the room…everyone kept asking me when I would be painting, and what color I would be painting the walls-new colors had to be approved by the current home owner. During set-up, curiosity got the better of everyone, and people continued to stop by to see what in the world I was doing to this room-what could possibly go with pepto pink walls?! we had to resist the urge to jump on the bed. you can never have too many pillows. ever. this dresser was a huge hit! i can’t even tell you how pleased i was with the window treatments! ‘lynley’ canvas–you can custom order these! I love all the details that went into making this room complete. I was really pleased with the bathroom as well-exchange some hardware and drapes and you can get a completely different look! thank you to everyone who came out to see the room! next post: celebrities and sledge hammers.